I consulted my guidebook, which pointed me in the direction of Kaleidoscope of Java. 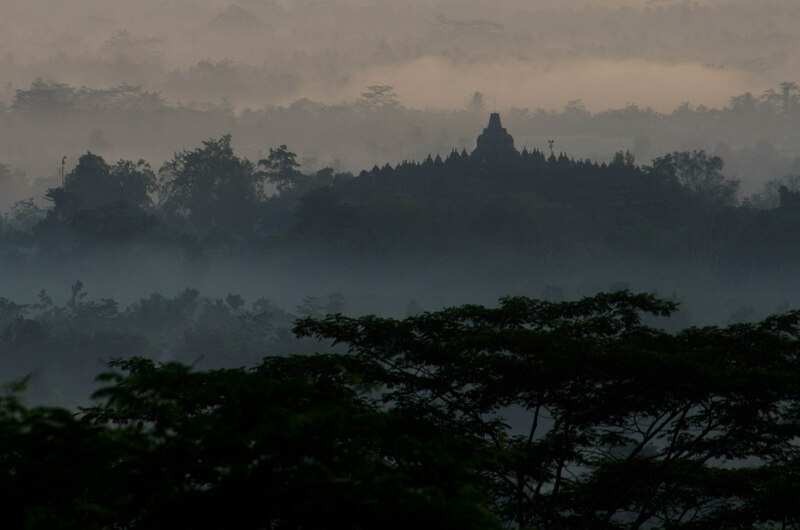 The day tour would involve Borobudur at sunrise, but from a slightly different perspective than our temple-top seats had given us last time. I hopped online and reserved two spots on the tour. Fast forward to 3:30 in the morning on our first day in Jogja. Josh and I jumped out of bed, got dressed, threw on some sunscreen and bug spray, and tiptoed out of the guesthouse, grabbing the boxed breakfasts that had been made for us. Walking toward us was a woman who looked much more awake than I was feeling and introduced herself as our guide, Atik. Having arrived around eleven the night before, Josh and I weren’t at our most energetic, but we had an hour to snooze in Atik’s car as she picked up two other couples and then drove us into the countryside. We awoke to the vehicle jolting up Menorah Hill on a poorly-paved path. A few minutes later, we stopped and everybody got out of the car and followed Atik to some seats that were propped against a hillside shed. She busied herself getting coffee and snacks for the six of us while we settled down in the chairs, shivering at the unexpected coolness of the morning. Though it was still dark, we could see the countryside stretching out in front of us with the two volcanoes jutting out at the edge of the horizon. 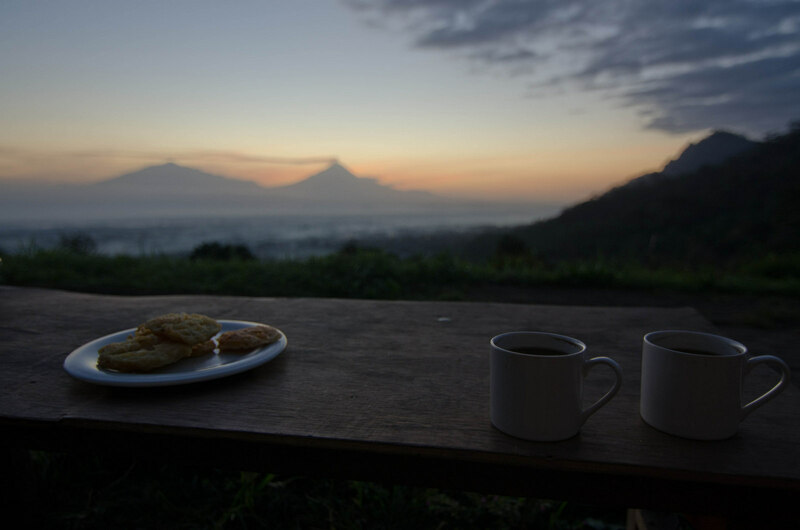 As the sky lightened, Josh and I ate the breakfast that our guesthouse had packed for us and nibbled on fried cassava with our coffee. Our group slowly started to feel awake and enjoyed Atik’s stories about the area that surrounded us. Finally, there was enough light to see more of what lay below us, which included an expanse of beautiful misty trees, just like the view from the top of the temple had shown us last time. 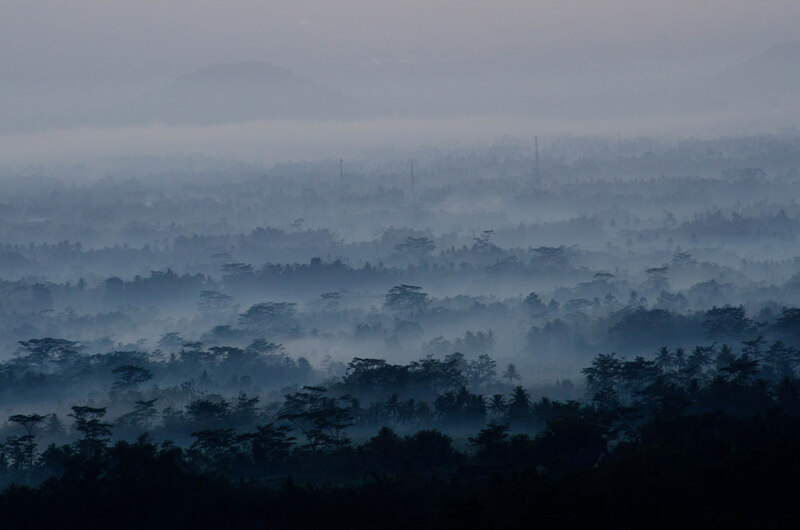 Josh and I scanned the scenery and were amazed at how difficult it was to spot Borobudur nestled among the trees. We certainly didn’t remember being right in the middle of a jungle last time we were there! Slowly, the sun crept out from behind Mt. 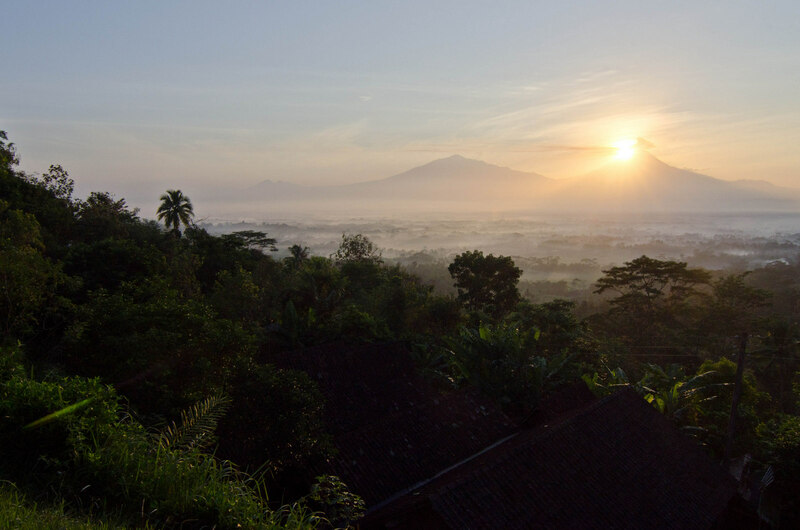 Merapi, and the morning instantly started to warm up. Atik pointed our group to a downhill path, and we walked along it as she drove the car to meet us at the bottom. Along the way, a local man greeted us with a “Selamat pagi!” and joined us on our descent down the hill’s winding paths. He knew no English except for the plants that he pointed out to us along the way. “Kentang! Potato!” he would exclaim, stopping to point out the field of potatoes. “Potato!” he’d repeat, followed by a pause to make sure we understood. “Potato!” he’d shout once more before moving on and pointing out the next plant on his tour. Our kind countryside guide left us at a small outdoor market, where Atik found us and explained that it is the woman’s job to go shopping every morning and then go home and make her family’s meals for the day. Before loading us back into the car, Atik introduced us to a group of local girls, who adorned me and the other two women in the group with bracelets and necklaces they had made from cassava leaves in return for holding a short conversation with them in English. “I’m fine. You want?” she asked as she held up a necklace and gestured for me to bend down so that she could fasten it around my neck. “Wow, I love it! Thank you! Aku suka, terima kasih!” I exclaimed. The girls giggled in surprise at my (poor) Bahasa skills, and we all said goodbye as the girls walked us to the car and waved as we drove away. A few minutes later, we arrived at Borobudur Temple. We paid, collected our free drinks, and sat down to sip on our coffees as Atik told us about the history and the religious significance of the temple. She then set us free to explore for two hours, recommending that we go around each level of the temple clockwise while attempting walking meditation as we worked our way to the top. While we weren’t quite feeling the meditation, Josh and I did enjoy being able to take in the temple at our own pace. Last time, we rushed to the top in the darkness with a crowd of other sunrisers. 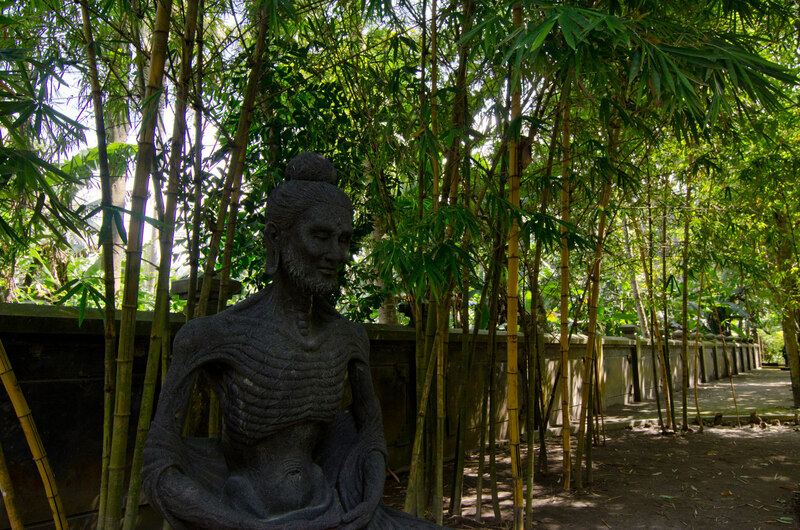 This time, we strolled around the grounds and took our time exploring each level of the temple, which was less crowded than we imagined it would be, likely because of the holiday. By the time Josh and I met up with our group and guide a few hours later, our appreciation of the temple had grown. 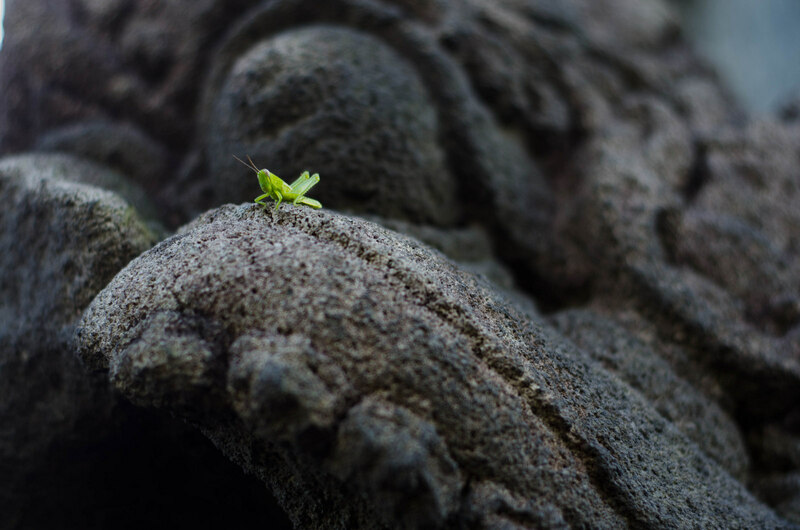 We were amazed once more at the complexity of the temple, and we also had fun creating back-stories for some of the reliefs on the walls as well as some of the critters we encountered. 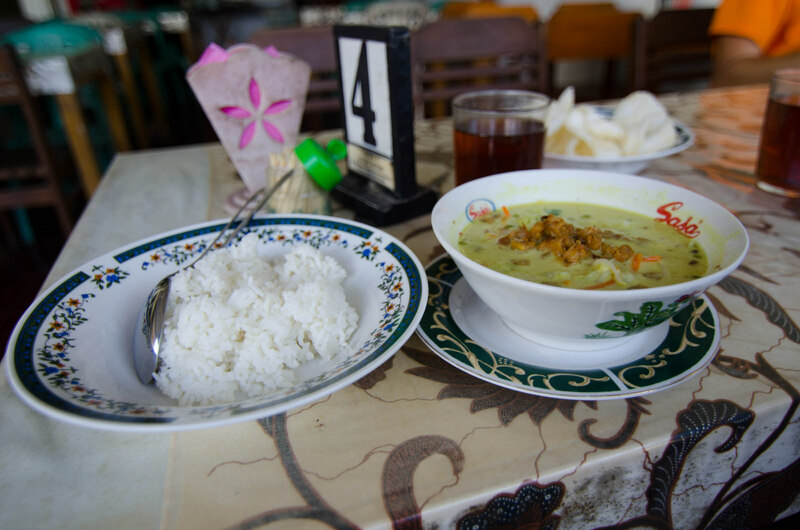 Just down the road from the temple was a small restaurant, where Atik’s mother cooked up some amazing coconut soup. Our countryside adventures were far from finished, even though it felt as if we’d already done so much. Our next few stops were in the nearby villages. Atik explained that many of the villages specialized in making one product. We stopped in two such villages. The first village made tofu and tempeh. Many of the homes within the village had equipment right inside their houses that allowed them to manufacture enough of the soybean staples to provide for their own meals and to barter with the other villages for different products. We stopped at a house where a woman knelt on the floor next to a basket of soybeans. 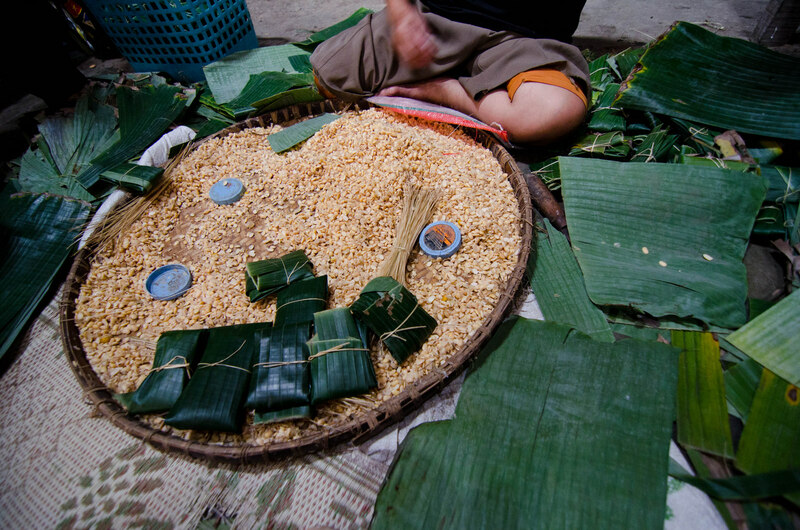 She methodically wrapped handfuls of the soybeans in big banana leaves; the 24-hour fermentation process would turn the product into tempeh. Though she thrust banana leaves into our hands and patiently showed us how to sprinkle the beans onto it and carefully wrap the leaf, none of us managed to make the perfect little soybean packages that were obviously second-nature to this woman. After learning more about the soybean production, we drove a few minutes to the next village. 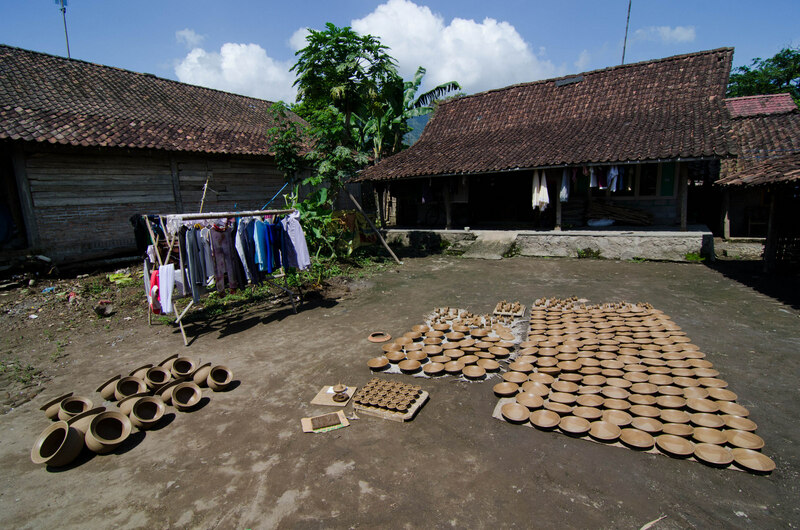 It was clear that this village’s business was pottery, as there were piles of ceramics drying in the sun wherever we looked. We stopped in an open-air workshop where there were several wooden pottery wheels and a woman who was waiting to help us get our hands dirty by making our own ceramics. 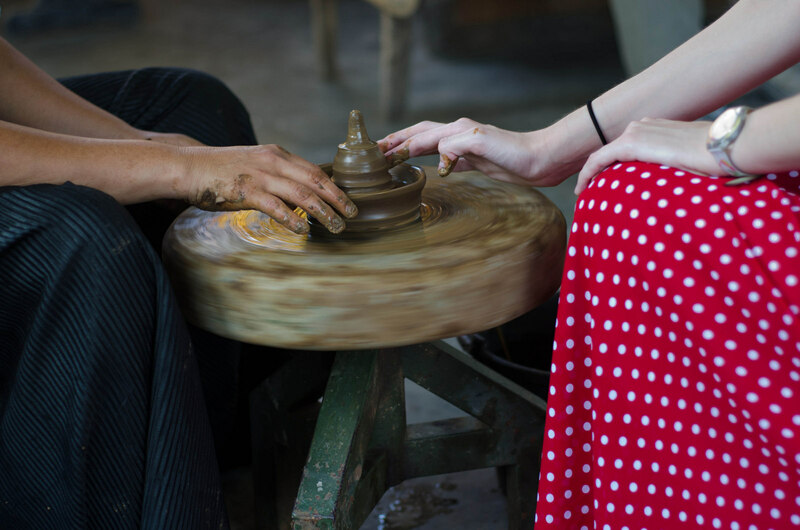 “No press,” she patiently reminded me over and over as my clumsy fingers tried to rush the hunk of clay into its new existence as a temple stupa. What amazes me to this day is that in both of the villages we visited, the products were made without any electricity. 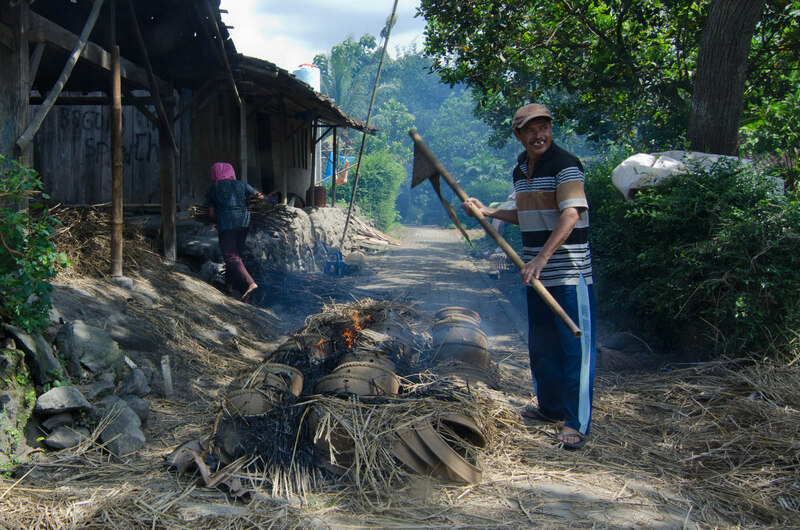 I can’t imagine many things in the US being produced without the aid of electricity and possibly an assembly line as well; and yet, these Javanese villagers wake up everyday and craft their products individually, by hand. 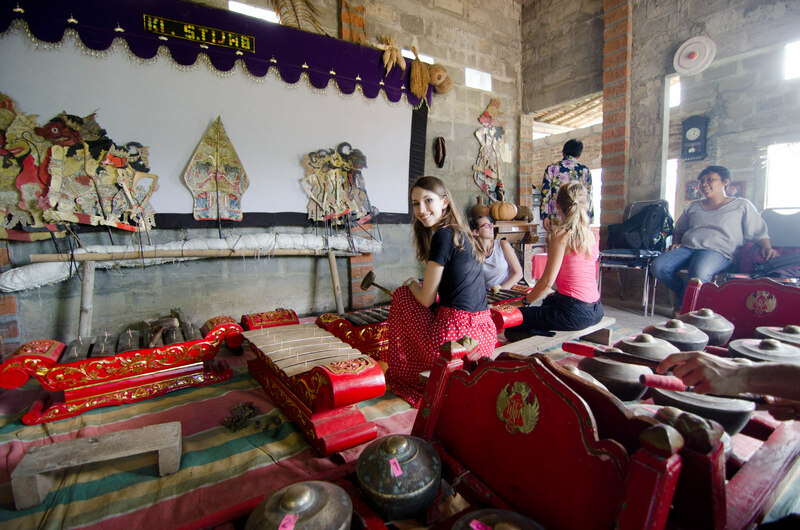 Even after the hands-on experience of the villages, our tour was far from over. We drove back to Menorah Hill, where we were surprised to discover the man who had shouted plant names at us earlier that day. 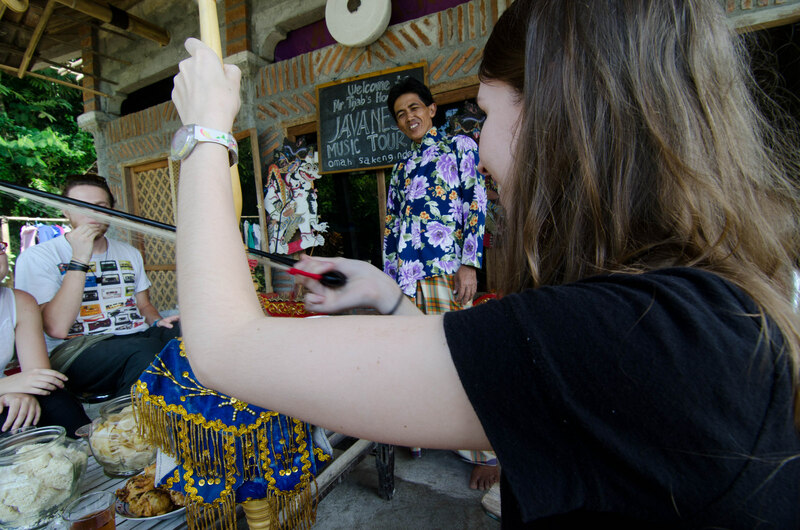 As it turns out, he is a local music teacher and was eager to teach us about the traditional Javanese instruments and puppets with Atik as our translator. 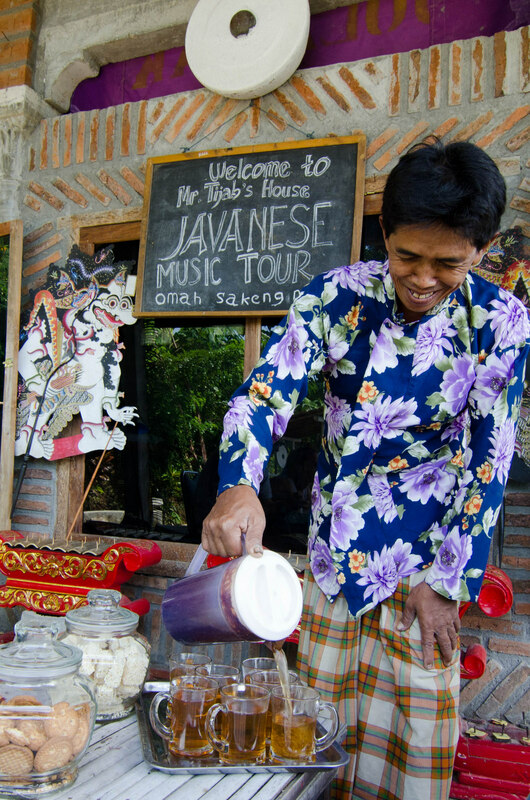 He seated us outside his house, where a table was covered with Javanese snacks that he urged us to try as he poured tea for everybody. After making sure we were all settled, Mr. Tijab disappeared into the house and re-emerged with a rebab. He sat down and serenaded us with the strange, one-stringed instrument while we ate. Next, he chose me as his protégée and helped me place the rebab on my lap and grip the bow. To be honest, I don’t like music very much, and I didn’t think the instrument sounded particularly good even when played by our teacher. I felt that the rebab just sounded like unnecessary noise regardless of how skilled the player was. This is why I was surprised at how much I enjoyed what came next. Mr. Tijab led us into his house, which was occupied by so many instruments that it wouldn’t be much of an exaggeration to say that he lived in an orchestra. He assigned us each an instrument and Atik helped translate his instructions. We practiced over and over until it was time to play all of our parts together. Gamelan music, which consists mostly of various traditional metallophones like the ones we played, is ubiquitous in Indonesia, and I was thrilled to be creating the same tune that I’ve heard playing in shops and restaurants all year. After perhaps ten minutes of playing, Mr. Tijab was excited to introduce us to still more traditional artifacts. He demonstrated some of the puppets while Atik told us the stories that were associated with each puppet character. 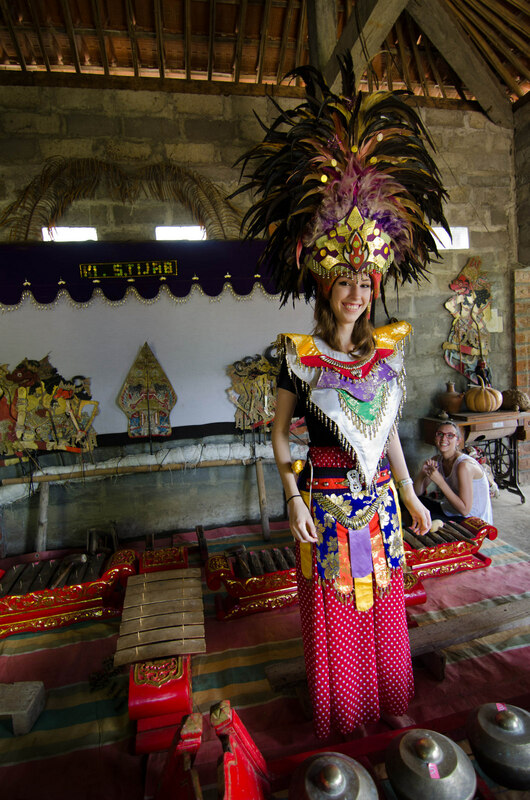 Then he brought out a costume that is worn during Javanese dance performances and insisted that somebody try it on. Since nobody else in our group volunteered, I stood up and Mr. Tijab rushed to dress me, lamenting that it didn’t fit properly because I was too thin–“Kecil!” he exclaimed when the belt slid right over my hips and he had to knot it several times in the back to keep it on long enough for Josh to get a picture. Before we left, Mr. Tijab insisted on feeding us again, even though we were all still full from our huge breakfast and the snacks that he had stuffed us with. 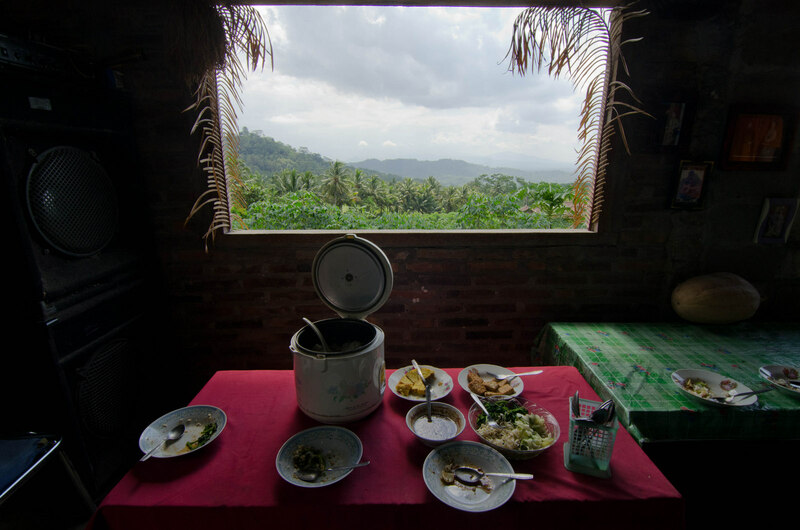 Nonetheless, we nibbled on tempeh and gado-gado as we appreciated the view from our host’s window. Our meal finished, we thanked Mr. Tijab profusely and hopped in the car. Our final destination was Mendut Temple and Monastery. Though Josh and I had been there before, we were excited to experience it with Atik. She led us first around the monastery, where she pointed out the important statues and symbols, gave us a condensed history of Siddhartha Gautama’s transformation into the enlightened Buddha, and even shared the story of her own spiritual journey. 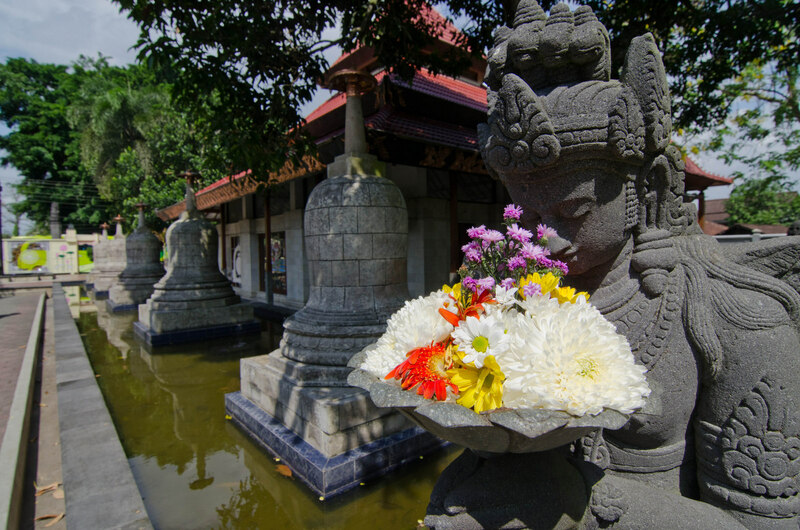 The temple is next to the monastery and, while much smaller than Borobudur Temple, it holds the same importance. There was just enough room for the seven of us to crowd in and rest on ledges as Atik set a timer and asked us to attempt meditation. I think I’m correct in saying that after such a long day, we all napped for those five minutes until the beeping of her phone woke us. We continued napping on the ride back into Yogya. By the time Atik dropped us off at our guesthouse early afternoon, Josh and I were in awe of how much we had done since she picked us up. 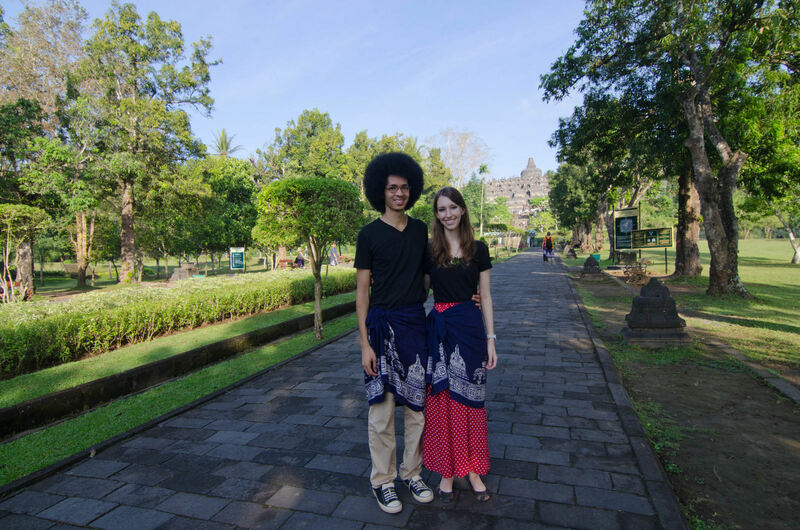 Without a doubt, this was the best tour we could have imagined of Borobudur, and I highly recommend it to anybody who finds themselves in Indonesia. 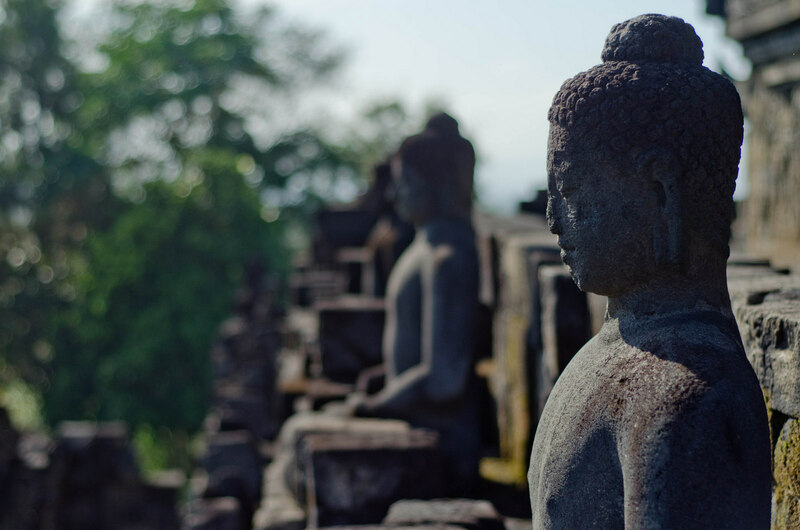 Yogyakarta is a splendid region of the country, and Atik’s tour will immerse you in the magic of Borobudur Temple and the culture of the surrounding area. Atik’s tour cost 300,000 IDR per person (~$25 USD) and included everything except for the entrance fee to Borobudur. Meals were included in the tour price, and it was no problem for me and Josh to get vegetarian food. Pick-up at your hotel is 4am and you will be dropped off around 3pm when the tour is finished.